This semester I taught two college composition classes at a community college. I started with 23 students in one class and 24 students in the other. Halfway into the semester, 7 students out of 47 just stopped coming to class. 20 students out of 47 failed the class. Without any doubt, I know I am a teacher. I love being in the classroom, and I know I am doing right by my students. My students this year told me they wished they had me as their high school English teacher. It confirmed for me that I taught my honors’ freshmen in high school well. I have no doubt that the students who did well in my honors’ class will do (and have done) well in their college English classes. However, it has become obvious that not all high-school English teachers did the same, and I’m sure it is for a variety of reasons that have nothing to do with their teaching abilities (but I’ll get to that later). 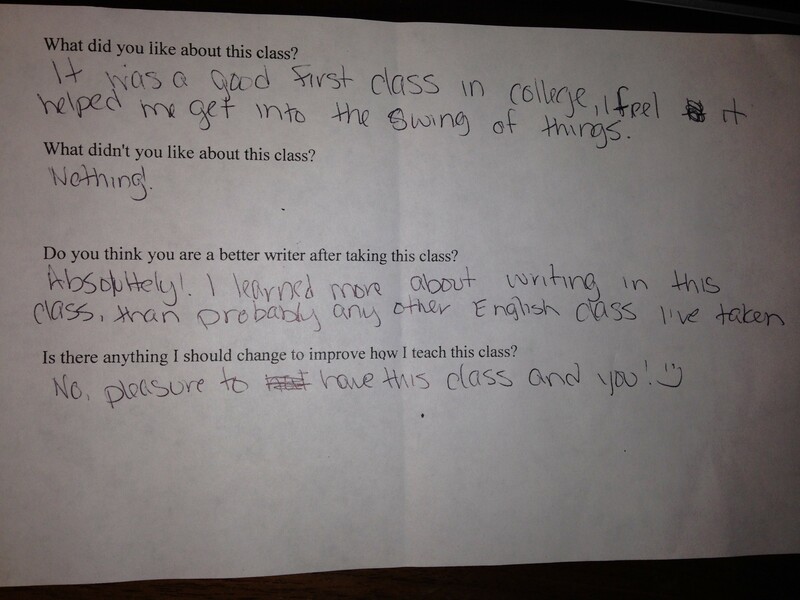 This semester, most of my college students had no idea how to use a comma, semi-colon, or colon. Most struggled with quotation integration and parenthetical citations. Their essays were filled with vague generalities and awkward, wordy, and, often times, fragmented sentences. What’s more frustrating is that most students had no idea what I was talking about when I made these types of comments on their papers. Because I am passionate about teaching, this weighs heavily on my heart. I will change what I teach and how I teach college composition in the spring because of this experience. Grammar has to make its way back into the high-school curriculum–not in isolation–but as a way to teach students how to communicate with the language of writing. I taught it that way in high school, not because I had to, but because it made sense to teach it that way. Only a handful of my college students said they had any kind of formal grammar instruction in high school–and it showed. I don’t know how to help my students become better writers without first teaching them the language that helps us understand writing–grammar is a way of thinking about language; once we know how to “think” about language, we can use that knowledge to communicate clearly and effectively and correct our writing when it doesn’t do that. Therefore, I will have to add intensive grammar instruction to the curriculum so that my students can learn how to think about language and their writing. Writing teachers need to be writers. Writing helps us to think clearly and logically; writing helps us to know and understand ourselves better. With such an important skill at stake, doesn’t it follow that writing teachers should be writers? Think about it: Would anyone hire a piano teacher who does not know how to play the piano, or a karate instructor who does not practice karate? There is an art to teaching, so not all writers can be teachers; however, shouldn’t all writing teachers be writers? Writing teachers don’t need to be published authors, but they should be able to write, without a lot of effort, the essays they ask their students to write so that they can help their students work through the thought processes, techniques, and organizational methods that go into good writing. If all writing teachers were writers, then I would not have had students in my college course who graduated from high school without knowing how to write a logical sentence; I would not have had students tell me that they never received feedback from their teachers on how to improve their essays; I would not have had students who doubted that their teachers even read the essays they assigned their students. Please know, I am not teacher bashing here; I know there are issues that prevent good teachers from fully engaging with their students and the writing process: They have over-crowded classes, disengaged students, and limited teaching time for actual learning. Add to that the movement towards objective tests, rather than subjective assessments and high-school teachers have an impossible task to accomplish. It’s definitely a Catch-22. This knowledge has led me to two conclusions: 1) I will always fight to eliminate this paradoxical problem in high schools, no matter where my path takes me; and 2) I will always be a writer and work on my craft, so I can be a better writing teacher. Summative standardized testing has ruined education. What is summative standardized testing? In the general sense, it is an end-of-year objective test that can be graded quickly. These tests usually consist of multiple choice, true-false, and/or some short answer questions that have a right or wrong answer. As a formative assessment, these types of tests can be helpful as a quick glimpse at the problems students may be having so that teachers can re-teach concepts; however, as a summative assessment, there are too many problems with these tests for them to be useful or worthwhile, no matter how much time they save. We see these tests in the form of common finals, high-stakes state tests, SAT, and ACT tests as well, especially since the writing portion for both college entrance tests have become optional. The only way truly to test knowledge is through the written word. In an attempt to collect data quickly, to lessen teachers’ grading time, and to pack classes with more students (more students means more money coming in to the school, and fewer teachers means less money going out of schools), testing has almost exclusively become standardized. I am convinced after this semester that the only way to improve education and to help our students become successful is to eliminate summative standardized testing and replace it with essays. If this actually comes to fruition, the only way teachers can function with this improvement is to cap writing classes at 15 students and to limit those teachers to no more than two or three writing classes per semester (for the other classes, teachers can teach courses that are more discussion and performance/project-based, rather than essay-based). I cannot see any other way teachers will have the time to help students become better writers. Some students need to take at least a year off from school, if not more, before going to college. Some students are just not ready to deal with the expectations at the college level. Some need to grow up; some need to get out of the classroom and experience life a little before sitting in a classroom again; and some need to figure out what they want to do with their lives before they take more classes that are meaningless to them. I know; the greatest fear for some parents is that if their children don’t go right away, they will never go to college. But if they go right away, they will waste a lot of money finding out they weren’t ready; they may also lose the confidence they need to move forward if they fail the majority of their classes. For those parents (and students) who are now wondering, if number five is true, how will I get them (or me) out of the house? The answer is we need to make vocational school a bigger and better option for students in high school. Children develop at different rates. Some may not do well all throughout high school, but that doesn’t mean they can’t be productive members of society. It doesn’t mean that they can’t take care of themselves and work at a job that they are good at until they find out what they really want to do and seek advanced training in that field. We have too many students wandering aimlessly through life–getting discouraged and depressed because they couldn’t function in a school setting; they weren’t taught a skill that they could use right out of high school. Imagine how different it would be for some students if they could work as technical, medical, or business assistants–becoming independent and paying their own bills–while they figure out what they want to do. I don’t have to imagine it because I had a student who did just that. She received certification as a nursing assistant and has been working in the medical field for the past couple of years. She is independent, confident, and ready to work towards her degree in nursing now. For those parents who refuse to believe number five is true, they need to require their children to take classes at a community college for at least the first year, if not for two years of college. Most students have no idea what they are in for when they go to college. A four-year college or university will have more distractions and will cost more money. If their children don’t do well, it is a less expensive lesson in work ethic and college readiness. Parents need to know when to help, how much to help, and when to let their children learn the hard lessons. I had too many 18+ year olds unable to function in their new adult world. They carelessly threw away their opportunities to grow and push themselves beyond what they thought they were capable of in this class. They couldn’t make decisions on what to write about; they couldn’t solve their own problems; and they couldn’t research topics they said they were passionate about. Sadly, I had a student who could not write a decent essay at the college level, but miraculously (or with a “little bit of help” from his father), he turned in a beautiful research essay that helped him get a C in the class. If this boy’s parent had helped him understand his educational responsibilities throughout high school, the father wouldn’t have had to write his son’s research essay in college to save his son’s grade. 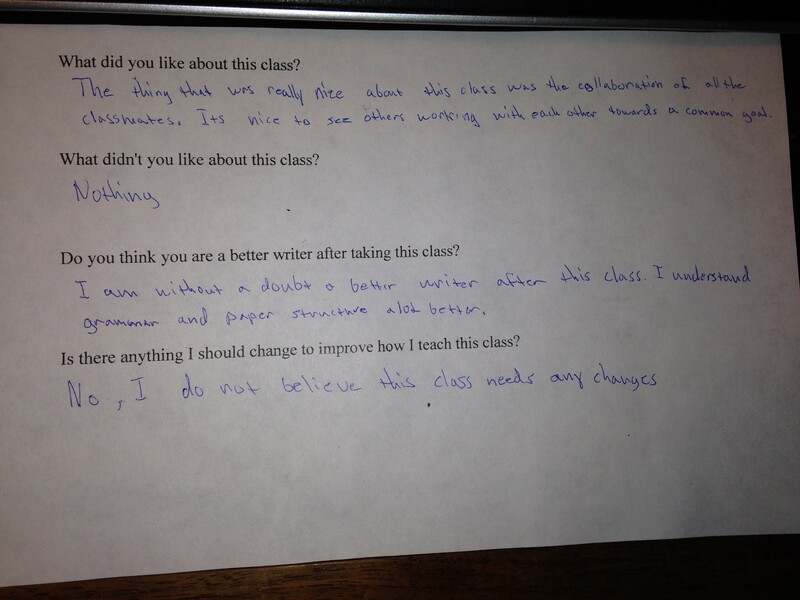 I just hope that this student sat next to him while dad wrote the essay. People are dealing with a lot of crap in their lives. I knew this before teaching at the college level (obviously), but what I didn’t know is that most people don’t know how to function while dealing with their crap. What the previous generation had that this generation doesn’t seem to have is role models: People who got up every day and dealt with their crap, or put their crap aside so they could get done what needed to get done. I watched my mother work a full-time job and nourish, clothe, and provide for her children as a single mom–all while dealing with a lot of crap. I learned from watching her. Admittedly, my students had difficult situations they were dealing with, but so many of them had no idea how to function because of them. They made excuses. They got drunk, high, or worse to numb themselves, instead of dusting themselves off and putting their heads down to get the job done–whatever that might have been. One way I try to help is by sharing personal stories. I want my students to know that I have far from a perfect life, but I keep plugging away because I have to–we all have to. We cannot escape our problems, but we can become better and stronger people because of them. Learning to write well is one of the most rewarding skills we can acquire, and I love being the person who helps students find and develop their writing voice. It is time consuming and, at times, tedious, but working with students and witnessing the transformation of their written work from mere words on paper to thoughtful written communication is beautiful and rewarding in itself. Regardless of the grade, students who engaged in the writing process, who worked hard to break free from their fears, walked out of my classroom with confidence and a readiness to meet their future challenges. They may not have discovered everything about themselves and who they want to be, but they know they can move forward on their journey. I can’t think of a better investment of my time. This entry was posted in Education Reformation, Pauline's Soap Box and tagged Education Reformation, Grammar, Parents, Students, Teaching, Writing. Bookmark the permalink. Great article Pauline! Keep doing what your doing for the future of our children! Thank you, Michelle! I will do my best! I had the benefit of a pre-Sixties-style education in this subject: parts of speech mastered by third grade; diagramming sentences in sixth grade. Worked in journalism for nearly 20 years. It boggles my imagination that kids don’t know those tools and rules by heart anymore. I agree! I don’t know how anyone thought we could teach writing without that knowledge. We spent some time with a homeschool curriculum that stressed grammar and I secretly questioned the value at the time. After my kids entered the local public school, I understood—some ‘old school’ is necessary. Learning the language is a step in the ‘classical model’ of education, isn’t it? Yes. Grammar instruction is part of the classical model. It works well for providing the language of writing. Where some curricula go wrong though are not using the language to help improve thought and then writing. Many people will question: Why do I need to know which clause is dependent and which clause is independent? We need to know this so we can correct our sentence fragments at the grammar level; however, at the thought level, we can improve our communication when we know which thoughts should go in the dependent clauses and which ones should go in the independent clauses; it will all depend on the purpose behind the essay. Not teaching grammar to our students has taken those kind of purposeful decisions away from them. Pauline I loved this article. As someone who just went back to attend community college after 7 years of being out of school, I agree 100% with all of your points on this matter. My English composition class was the same way, it started out with about 15 students and by the end of the semester only about 5 students were left doing the work and attending classes regularly. Many other students just stopped coming to class and our teacher mentioned many times how this worried him as all of them were failing. I believe this is mostly due to not being able to deal with their “crap” and concentrate on school at the same time. I think back on my last few years and remember all the crap I dealt with, I don’t think I could have gotten through school successfully while experiencing those very important life lessons. Sometimes I get discouraged when I see kids from High School that have received degree’s and have new career’s, it makes me feel as though I have accomplished nothing. However for me I think taking time off from school and getting work and life experience really helped me grow up and figure out what I want to do with my life. Now I am ready and capable of concentrating on getting my degree in psychology and still manage a full time job along with all the other crap in my daily life. I just wish I could have you as a teacher, as many teachers I have come across do not posses the passion for teaching that you very clearly do. Your teaching experiences assessment surfaced some fundamental problems in higher education. I have similarly concluded–after 15 years of teaching across 9 different universities–that indeed, most students are unprepared for the college milieu; in fact, as you suggest, a significant proportion of our charges should not be enrolled immediately after HS graduation, if ever, given their intellectual disinterest and marginal capabilities. A dramatic educational reorientation, a profound philosophical shift, is needed in the U.S.: that is, technical vocational training must be promoted as a career alternative equally valuable and prestigious as the liberal arts experience for high school graduates embarking on their preparation for the labor market. Secondly, the supposition that every has a “right” to a college education is egalitarian tripe; would it be rational to assert that everyone has the “right” to a professional football or music career as a consequence of human equality? I strongly affirm your observations regarding student incompetence in grammar and syntax. Many of my students have regularly crafted “run on” sentences, written with poor conceptual flow and demonstrated minimal understanding of comma, colon, etc. usage. I am certain that such student ineptitude emanates not from so much from teacher intransigence, but rather from the absence of parental support/discipline and school administrations obsessed with graduation rates at the expense of rigorous, genuine learning. I possess much experiential evidence that the latter heresy is rampant in higher education as well. I also concur with your assertion that students must be nurtured in “[knowing] how to ‘think'” about language. This objective encompasses, I believe, the sina qua non of any educational achievement: learning to “think critically” about the epistemic organization, conceptualization and interpretation that ground knowledge in every discipline studied! I have found this essential element to be missing from business programs–in which I have, unfortunately, been consigned–in favor of superficial interactive pedagogy that neglects most of the basic theory and empiricism that constitute the scientific foundation of the given field of study. It follows that students DO NOT READ the assigned material–with professor complicity–fail to grasp the basics, and leave courses without enhanced cognitive development or content knowledge. Another issue at least implied in your article is the recalcitrance of the contemporary student. Clearly, this is the age of discourtesy and disrespect for the authority of the teacher. In fact, I have had 19-20 year old students tell me how to teach my courses, that is, when not talking, texting or sleeping in class. The supposition that this “digital” generation cannot focus for 60 – 90 minutes as a consequence of continuous sensory stimulation (e.g., cell phones, video games, etc.) is merely a subterfuge or rationalization for deterioration of personal discipline; it has been egregiously abetted by administrations and parents. Until education reinstitutes READING as fundamental, improvement in educational outcomes is dubious. Regrettably, I have conceded my inability to function in today’s university classroom, in part because I am unable to adapt to the “student engagement” movement that eschews hard work (studying). Yet my disillusionment is equally due to snotty, apathetic and disinterested students. I hope you continue to have the success you articulated in the article, but it remains a mystery to me. Thank you for sharing your experiences, although I am saddened by your concession. Education is a difficult profession in the United States. Sadly, I do not encourage students to become teachers. Until the problems that you so eloquently stated are resolved, education will continue to spiral downward. I’m not sure what it will take to change the direction of education, but I hope comments like yours and posts like mine will make a difference, somehow, someway. Thank you. I contend that the primary source of these classroom difficulties is a systemic deterioration of American cultural norms of high standards, respect for authority and personal responsibility; this trend will be very difficult to reverse, as our youth really don’t develop a sense of tenacity and sacrifice in learning or working; in fact, like the ubiquitous urge of the young, they entrench themselves in pop-culture anti-establishment veneration that wastefully pushes them away from serious intellectual pursuits. Indeed, many thinkers have commented on the individual, assiduous effort necessary to intellectual growth (e.g. “Whatever is good to know is difficult to learn” –Greek Proverb; “The ultimate goal of the educational system is to shift to the individual the burden of pursuing his education.”–John W. Gardner; “I cannot teach anybody anything; I can only make them think”.–Socrates; “Education comes from within; you get it by struggle and effort and thought.”–Napoleon Hill). Many members of my extended family are or were teachers in secondary education, and they have become quite cynical about the profession. The stories they have related have often been so incredible, so fantastical that I would find myself laughing hysterically at the absurdities recounted. Hence I believe you are correct in not encouraging students to prepare for this vocation. Regrettably, I can provide no antidote to these cultural afflictions other than conservative idealizations that are usually scoffed at by the educational elite. Our daughter graduated from community college this May. She repeatedly marveled that so many students just didn’t come to class. “Their parents are PAYING tuition! The LEAST they can do is SHOW UP!” You mention that you learned from your mother’s example. Our daughter & I can list a whole slew of young adults her age who watched their single parents work hard, a parent return to college when a career stalled due to a company going out of business, etc., but the kids learned ZERO from the example. Instead, they live in an alternate universe in which they’re convinced they’re entitled to 24/7 entertainment, high pay for a job, any job, they half-do or worse; they disdain entry-level jobs & refuse to accept them if offered; they act as if someone will always bail them out of their lunacies. You have to wonder how they’ve managed to delude themselves so thoroughly in spite of real life. I have seen that entitlement. There are so many issues, aren’t there? Where do we begin to right the wrongs? Thanks for sharing your experiences! Ah, but grammar -is- still part of the high school curriculum. It’s just that it’s taught in foreign language classes, not English classes. After all, English classes have to be used for “anything not written by dead white men” literature. I was fortunate enough to graduate from high school before No Child Left Behind came into being, and got at least some grammar here and there. But when I taught undergrad Spanish classes for a few years in graduate school, the overall lack of grammar education became apparent. It’s hard to teach students about verb conjugations when they don’t know what a verb is. Excellent point! Thank you for sharing your perspective!